We have been meaning to get a trellis for the Lady Bank’s Rose in the front garden for a long time, but it wasn’t growing very fast and we concentrated on other, more important tasks. That all changed this Winter and Spring, though. With the large amount of rain we had — along with the removal of a short fence that was blocking the sun — the rose added a lot of vigorous growth and bloomed quite nicely, even for a relatively small plant. 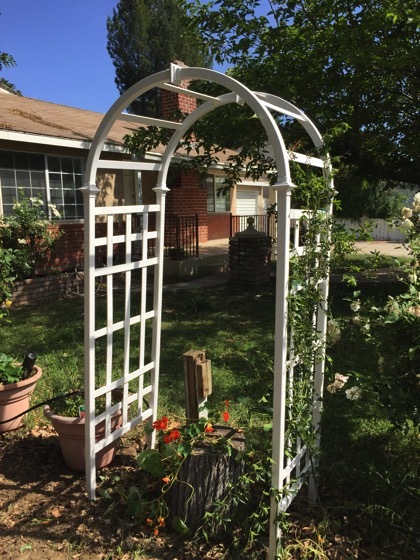 You can see from the photos that it was big enough to cover most of the side of the trellis after we trimmed and tied the main stake to the newly built arbor. We need to do a bit more staking to prevent any blow down during our windy days and you can see an ugly remaining fence post that we need to cut off as best we can. it is set in cement and littered with nails so I need to find a clear path through so I can use the hand saw to cut it down as low as possible. Looking out the window after cleaning up from out work, Rosanne said “It looks like it has always been there” and indeed it does. it blends in well, while also adding a nice decorative touch. If you are looking for an arbor for your garden, this “Athens” model is all vinyl and no maintenance, something I had to have when I went looking. Assembly was easy and required nothing more than a power screwdriver to drive the self-tapping screws. I look forward to it being here for many years to come. 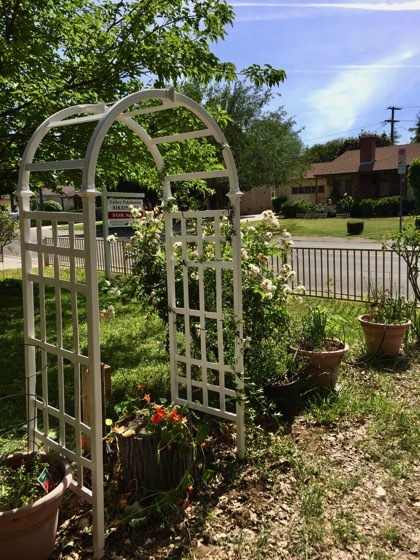 You can buy this arbor from Amazon, like we did, for $128.24 with Free Delivery. I might be purchasing a second for a clytostoma vine in the back garden. The trellis there came down years ago and could really use a replacement. Categorized under: Build/Make, Design, DIY, Equipment, Garden Decor, In the garden, Landscape, Photos, Projects.